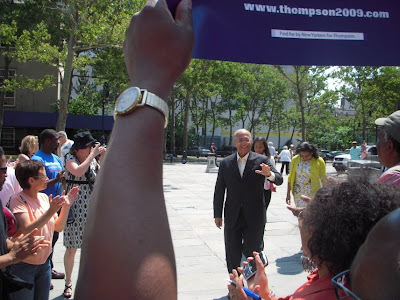 Thompson kept it general about a lot of things: Bloomberg is doing a horrendous job- He, Thompson, would be doing a much better one. 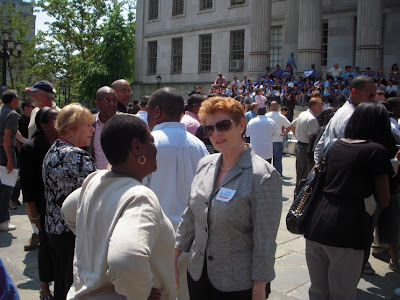 I am running for mayor because in these difficult times, we need a leader who is on our side. In these difficult times, we need a leader who will move our city forward by ensuring that all New Yorkers, not just the rich, prosper. All of us here today know, for the past eight years Mike Bloomberg has been focused on the people at the top, Wall Street crowd, the developers, the wealthy. Well, let’s be honest: That approach hasn’t gotten us far. Mike Bloomberg might think this city can’t afford to have someone else as mayor but I believe that New York can’t afford another four years of Mike Bloomberg. We can’t afford another four years of a mayor with the wrong priorities. We can’t afford another four years of a mayor who protects the wealthy while making it harder for everyone else to make ends meet. We can’t afford a mayor who give money away to Wall Street instead of investing in small businesses. And in these tough times we can’t afford to make the wrong choices. There is a simple choice in this election: This is a choice between two guys, one who wakes up every day and protects millionaires, fights for developers and giveaways to Wall Street- - And ME, . . . a guy who will get up every day and fight for our hard working families, for parents, for our seniors, for small businesses, for New Yorkers across all five boroughs and for you. We are waiting because it is obvious that Thompson will soon have to say a lot more and get specific about Atlantic Yards. And as we said when we wrote previously, it should be easy for him to come up with some stiff criticism: The project which was always bad has gotten so much worse. A lot of people were there. This photo is early when the crowd was still growing. 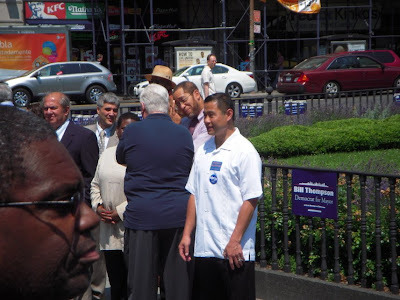 Two candidates for City Comptroller were there, both Queens City Councilman John Liu and Brooklyn City Councilman David Yassky, both opponents of Atlantic Yards. 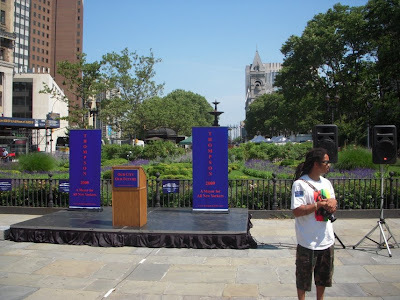 We wrote about criticisms Mr. Liu expressed about the megadevelopment in June. 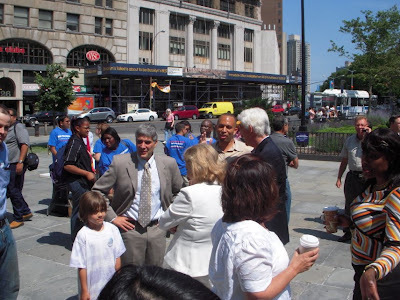 (See: Sunday, June 7, 2009, A Lambda Night: City Political Candidates and Development (Focusing on Atlantic Yards and Dock Street)) We had a few words with him Saturday about the boondoggle project which he again said really needs to be stopped. Mr. Lui brought troops to Brooklyn. In addition to taking on the Dock Street project recently, David Yassky has made quite a few appropriately emphatic on-target statements against Atlantic Yards in recent months (See: Wednesday, May 6, 2009, City Council Races (33rd and 39th CDs): Candidates’ Positions on Development and Effective Action They Would Take to Stop Atlantic Yards (Part II).) 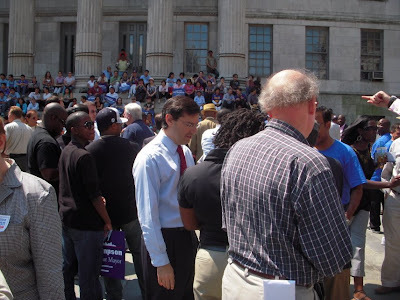 Mr. Yassky also showed up to speak about Atlantic Yards at the MTA’s meeting the end of June. Like almost all of the elected officials at that meeting, he criticized the MTA’s giveaways to Ratner. He said it undercut the entire case MTA had made when it pleaded that it was short of funds, making for a cynical and disillusioned public. 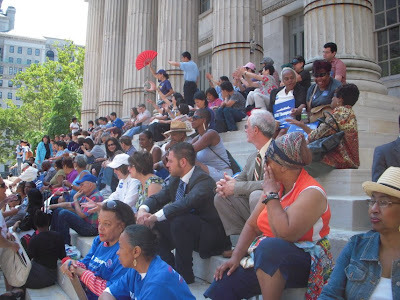 Another stalwart Atlantic Yards opponent, City Council member Tish James, was there. At least where we were standing it sounded like she got the loudest cheers of everyone whose name was announced from the lectern. The local City Council candidates are opposed to Atlantic Yards pretty much across the board. Two of them were there. Jo Anne Simon, candidate for the 33rd District. And Josh Skaller, candidate for the 39th. We hear that Mr. Skaller is doing very well in his campaign (in terms of signed petitions and fund raising- none from developers) and that his success probably has a lot to do with people’s appreciation of his deeply ingrained opposition to Atlantic Yards. . . .whether the agency [MTA] was performing its fiduciary duty on behalf of the public and suggested that the term "value engineering" connoted a bailout. Anyway, as we said, we will be very interested in hearing what specifically Mr. Thompson has to say about Atlantic Yards. How categorically will he distinguish himself from the Mr. Bloomberg who is not doing a good job as mayor? 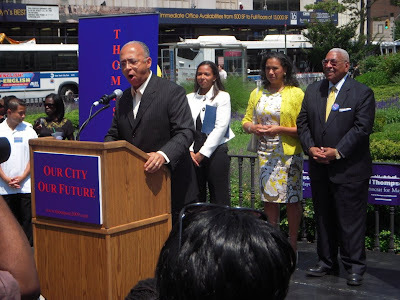 Tony Avella is Mr. Thompson’s rival candidate for the Democratic nomination. We know how thoroughly opposed Mr. Avella is to Atlantic Yards. We also that the Green party candidate, Billy Talen, (aka Reverend Billy) is wholeheartedly opposed to the mega-project. Saturday the crowd picked up the chant, “Billy T is for me.” That, by coincidence could also mean “Billy Talen.” But, in Noticing New York’s view, if Mr. Thompson is clearly “for the citizens of New York,” then we think he needs to avoid confusion and make clear statements about what’s wrong with Atlantic Yards and why Bloomberg’s own support of it is wrong.